Complex systems can be defined as systems that have emergent properties, which we observe but cannot understand easily. My question: Social Software also has emergent structures and properties. So can we define social software as complex system? This entry was posted in Conference, Emergent Semantics, General, Social Software on April 13, 2007 by Mathias Lux. This year’s Special Track on Knowledge Organization and Semantic Technologies 2007 (KOST ’07) will be a further cool event (well I’m a chair there, if that’s no guarantee 🙂 ). The special track will take place 5th September in Graz, Austria. Read the full CfP here. Submissions are to be uploaded until 7th of April. This entry was posted in CfP, Conference, Emergent Semantics, General on February 9, 2007 by Mathias Lux. Yes I know … this is not about MPEG-7 and multimedia, but on the other hand its very interesting 🙂 Some months ago I started to analyze the structure and usefulness of folksonomies (see here or wikipedia). Especially I was interested in methods for tag similarity computation and the extraction of structure from the chaos of tags and resources. Today I finished an interesting little project, which allows me to create a tag network out of samples taken from del.icio.us. 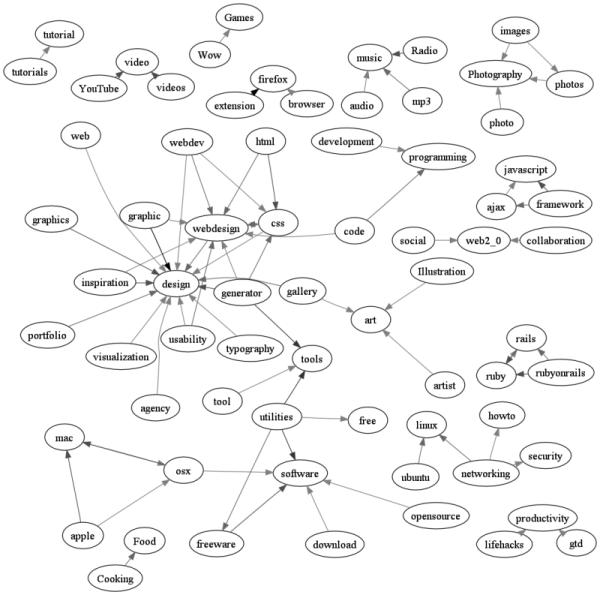 The shown image (click to enlarge) shows a network generated from a list of popular tags from Dec. 28th 2007 in the afternoon. The color of the edges indicates the amount of similarity. Note that the used method does not result in a symmetric measure and therefore an undirected graph, but is normalized based on the source tag and is visualized as digraph. The similarity of tags is based on the co-ocurrence analysis published by Peter Mika in Ontologies are us: A unified model of social networks and semantics. The visualization has been done with graphviz. The sample from del.icio.us has been taken by monitoring the RSS feed for recent additions. This entry was posted in Emergent Semantics, General, Social Software, Web2.0 on December 28, 2006 by Mathias Lux. Following Cow Paths in Bonn I did a presentation on user generated metadata in the Web 2.0. This user generated metadata (short UGM) is the result of (social) interaction in the web. I put up my slides on user generated metadata here: UGM 2006-11-17 small.pdf. This entry was posted in Conference, Emergent Semantics, General, SemanticWeb, Social Software, Web2.0 on November 17, 2006 by Mathias Lux. This process is discussed in length within the workshop on the symposium, which we (Armin Ulbrich and myself) are giving tomorrow … so stay tuned (we will post the slides on the portal associated to the event and give the link here to). This entry was posted in Conference, Emergent Semantics, General, Social Software, Software, Web2.0 on November 16, 2006 by Mathias Lux.